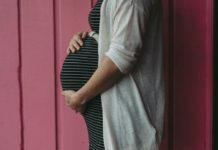 This is one of the posts that I am really excited to write about. I love body butters and am a great hoarder of body moisturisers and lotions. I initially started with The Body Shop body butters and got hooked to it and then went on to try different brands. I have tried various fragrances: chocolate, fruity, nutty, minty, etc. 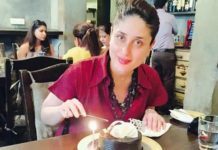 When I started writing, I initially found it difficult to shortlist just 10 best body butters in India as there are so many butters I love. 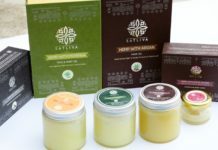 I finally narrowed down and here is the list of top body butters that you need to try this winter. 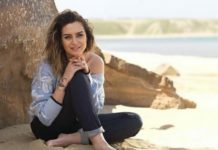 In this list, you will find a mix of moisturizing body butters for every budget, fragrance, skin type, natural, ayurvedic, etc. 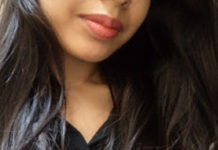 I have normal skin which becomes extremely dry here in Bangalore during cold weather. And add to that, I work in an A/C environment all day which leads to dry, patchy skin. 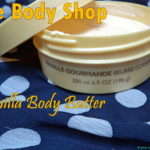 So I prefer body butters over body lotions as they are more intensely hydrating and nourishing. 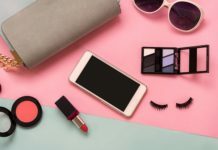 Plus, their fragrance typically lasts longer than body lotions. 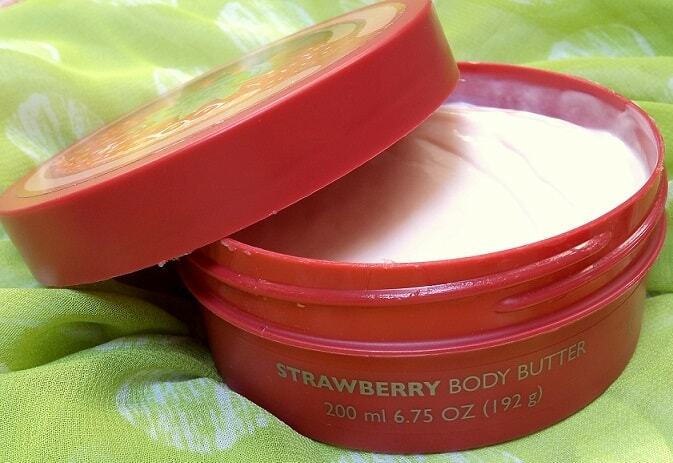 Undoubtedly TBS has the best body butters in the Indian market and their strawberry variant is the most popular one. It has a delightful sweet strawberry smell and the fragrance lingers on for a long time. It is non-greasy, quickly absorbed and is meant for normal to dry skin. 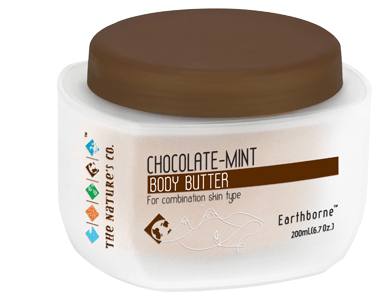 Extra dry skin people can try their Cocoa Body Butter variant. VNA has reviews on other fragrances as well so do check that out. 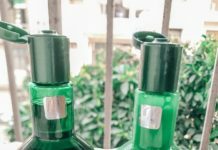 Price in India: Rs.1095 for 200ml. I have recently started trying The Nature’s Co body butters and I am really impressed. This one has has a really yummy chocolate fragrance with a hint of refreshing mint reminding me of delicious ice creams. It is very emollient and buttery in texture and glides easily on skin leaving it baby soft and smooth. Sensitive noses might feel the TBS Cocoa butter scent is too strong, those can give this a try as here the chocolate fragrance is more subtle without being overpowering. 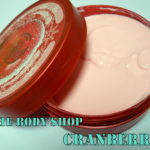 Fruity fragrance lovers can try their Mixed Berry body butter. Price in India: Rs.1295 for 200ml. 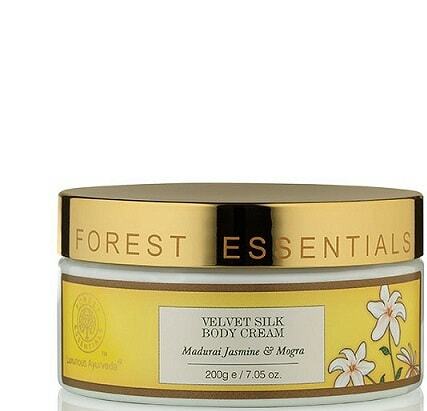 Possibly, one of the most affordable, pocket-friendly body butters in India. Nevertheless, its a wonderful product with an amazing scent of wild roses. 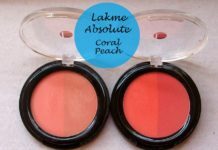 Its very light and non-greasy and unlike other body butters, the consistency is very thin and so can be used even in summers. 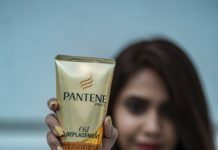 Price in India: Rs.295 for 100ml. 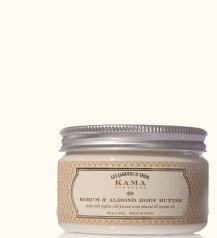 For those looking to go the natural ayurveda way, the popular Kama Ayurveda too has a body butter. 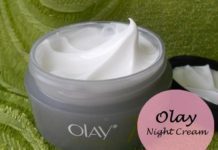 It is one of the very intensely hydrating body butter for super dry skin types. 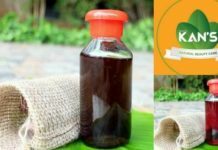 Enriched with 100% organic cold pressed sweet almond oil, coconut oil, shea butter, cocoa butter, kokum butter and aloe vera juice, it relieves dryness, removes dead cells and improves elasticity of skin. 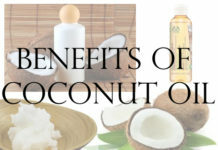 It also helps to lighten stretch marks with regular usage. Price in India: Rs.1195 for 250g. This is a delight for fruity fragrance lovers. 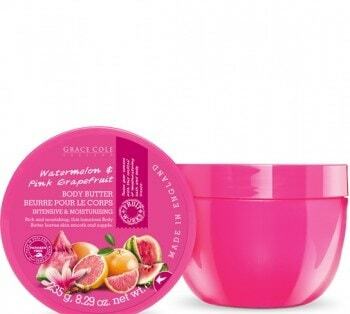 With the juicy and fruity blend of watermelon and pink grapefruit, you will be smelling fresh all day long with this body butter from Grace Cole. It gets absorbed quickly, hydrating the skin very well without leaving any oily residue. 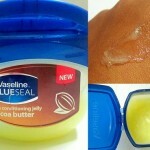 Though it doesn’t provide deep moisturization as TBS body butters. 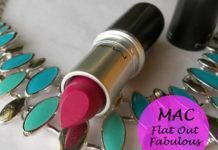 Suitable for normal skin or summers. Price in India: Rs.650 for 250ml. 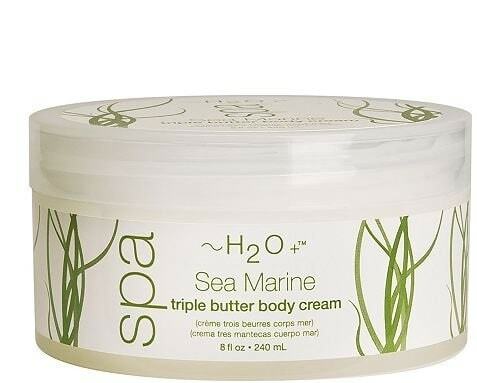 A luxury blend of marine spa botanicals including brown kelp, sea lettuce and sea fennel to deeply moisturize the skin while also accelerating collagen synthesis to restore skin’s firmness and suppleness. Notes of fresh eucalyptus and cool mint scents is energizing and invigorating. Price in India: Rs.1700 for 240ml. 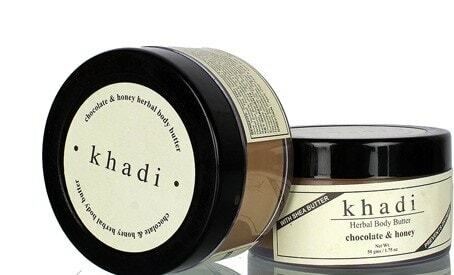 Khadi, a well known and trusted brand since ages, has this very affordable body butter which you can give a try. With a heavenly scent of cocoa powder, this is a light and whipped cream offering adequate hydration for dry and patchy skin. The consistency might be a little heavy for day time use, but very appropriate for overnight moisturization. Price in India: Rs.140 for 50g. Another luxury ayurveda body butter made from cold pressed organic sweet almond oil, olive oil and wheatgerm oil. Soothes and softens the skin leaving it silky and smooth. The delicate and sensuous fragrance of jasmine is sure to uplift your senses. It it light-weight and hydrating. 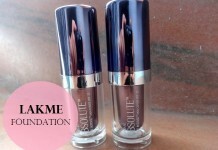 Suitable even for sensitive skin. Price in India: Rs.1575 for 200g. 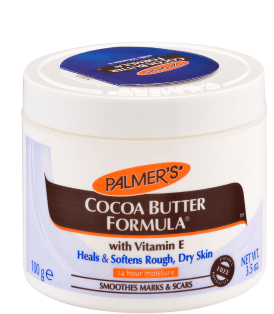 Made from pure cocoa butter and enriched with vitamin E, it heals and softens rough, dry skin and also it is the best product for fading stretch marks and scars. 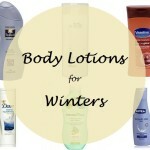 A savior for dry skin and a must have product during winters. It performs equally well to TBS butters but is more affordable. 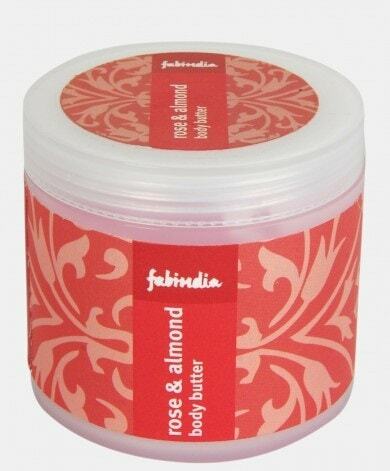 Another one of the top body butters in India. Also a detailed review coming on it super soon. 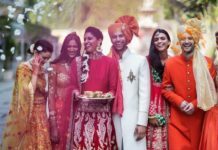 Price in India: Rs.425 for 100g. If you love warm spicy scents, then you would definitely like this body butter which has a whiff of ginger with fruity mix. Its not too strong or overpowering. 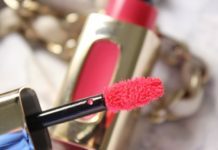 The texture is medium consistency suitable for normal to dry skin. Fruttini is a German brand which has recently ventured into the Indian market and they have so many different variants like cranberry choc, cherry vanilla, milky orange, raspberry cream, etc. And the quantity is huge as it comes in a 500ml tub. Price in India: Rs.1098 for 500ml. Apart from this, some other decent body butters I have tried are Auravedic Pure Lightening Whipped Body Butter, TVAM Rose Honey & Litchi Body Butter, Vedic Line Choco Vanilla Body Butter, Nyah Peach Grapes & Cherry Blossom Natural Body Butter, TBC By Nature Revitalising Cucumber Body Butter. Currently I am using Vert Pomegranate Almond Whipped Shea Body Butter and next on my wishlist are Nation Orange Blossom Body Butter and Votre Nourishing Gold Body Butter. 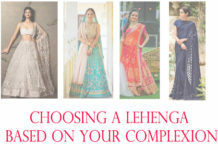 Do let me know if you would like me to review any of them. Share your favorite body butters in the comments below. Which is your favourite body butter? Share your reviews with us. 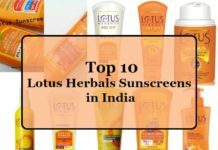 Yes, TBS and Palmers are by far the best for dry skin. I love TBS body butters. 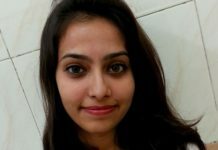 They are absolutely great for winters. I am using Palmer’s right now and it is amazing ! 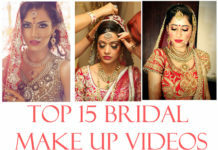 Dipti recently posted…Featuring Skin18.com – A Website For All Korean Skincare Products! 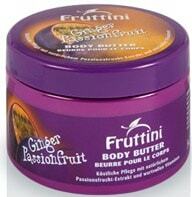 I have used The Body Shop Satsuma Body butter and I love it..
TBS ones are amazing! So is the Kama Auyrveda! from where did you buy or get fruttini products in india?